Jaipur by Nite ended with great food, live music and marathon. 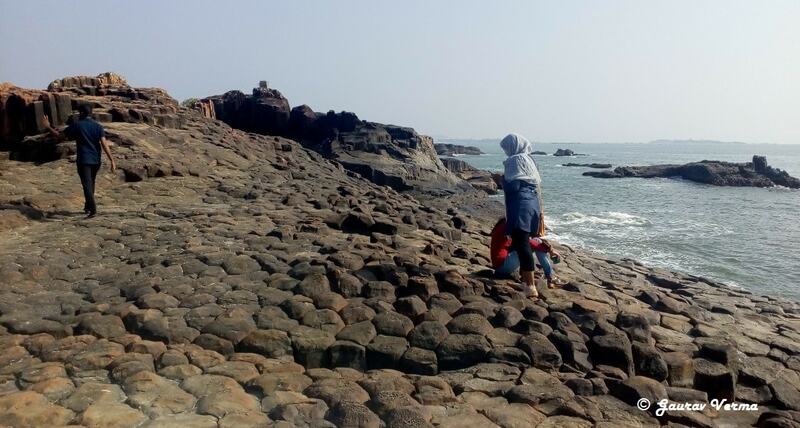 When you are left with a follow-up act to something as soul-stirring as a musical night by Mame Khan and Indian Ocean, the task is indeed a tough one. The ultimate day, or night – Bite Fest, of Jaipur by Nite, however, didn’t fade out to penultimate evening of divine rhythms and musical bliss. Just think of daal-baati-churma, the spicy panchmela daal and crispy baatis dipped in desi ghee with sweet coarse churma, and you would be lying if you didn’t salivate a bit. Add to that the authentic Rajasthani methi-mangodi ki sabzi served with makki and bajre ki roti, lehsun ki chutney and sangari ka achaar making for those perfect accompaniments, and I am sure you would have found your own heaven right there. I definitely did. The super crisp golgappas tempted me into filling myself even before the ‘dinner’. The local band Swaraag’s Rajasthani, sufi and Bollywood numbers adding that perfect ambience made it a joyous weekend. Also, the wood-fired oven didn’t only add to the flavours of the pizzas on another restaurant’s stall, the smoke and warmth of it in that breezy night almost hinted at the arrival of chill in the air. The rustic seating with wooden benches, cots, colourful cushions thrown in, cane garden chairs and low stools adorned with local craftwork added to it all. Luring the tastebuds and making many forget about the diets were stalls serving Kashmiri cuisine, range of burgers, pastas, desserts, south Indian food, and more. For those who still braved the temptation despite such a spectacular spread around, a couple of restaurants working in the healthy food zone, came to the rescue. It’s rather a point of debate though if they gained on health or lost on taste! 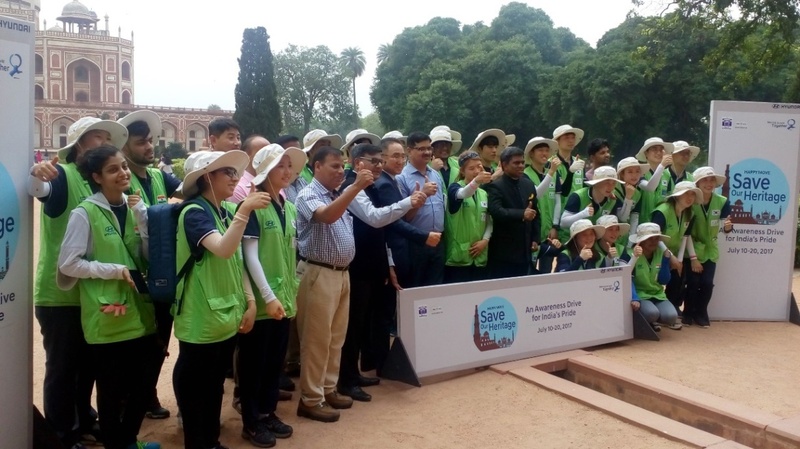 Health was not a lost case at all as over 1,500 enthusiasts from Jaipur, nearby cities and other part of the country got together for the last act of the three-day event – 10km and 5km marathons. Post 10, the Mubarak Mahal and the grounds had an altogether different buzz to them as groups of runners, in their colourful sportswear, started collecting around for the marathon. The longer run started from the City Palace gate, went to Gandhi Circle on JLN Marg and back. The route for the shorter run was from the Palace to SMS Hospital and back. Flagged off by the erstwhile royal Padmanabh Singh, the marathon made for quite a picture with traffic-less roads and lit-up historical buildings as the backdrop, showcasing the city’s beauty in the night. Just like night and moonlight adds to romance, Jaipur by Nite did to the city’s charm with its presentation of music, food, fun and the run. Do mark the dates for the next year to experience this yourself. Indian Ocean and Mame Khan spellbind all with their performances at Jaipur by Nite. There’s a reason Indian Ocean songs would not be played at dance parties, weddings or at DJs – they have a meaning. Their songs take you to a level where you understand them and not just hear. Their compositions are the ones that give you goosebumps. Perhaps why they rightly complement the classy, royal and select setting of City Palace, Jaipur, and vice verse. The second day of Jaipur by Nite couldn’t have had a better finish than Indian Ocean belting out their soulful fusion of folk, classical, rock... The women’s car rally on September 9 kicked off the fifth edition of the event. The second day, September 15, was dedicated to quenching your soul and tastebuds. If Indian Ocean, preceded by Mame Khan, took care of the soul, the food stalls from across the city didn’t let down the appetite. The colourfully-lit and looking all the more royal in the night, the City Palace, with a bunch of kalbeliya dancers and performers around Mubarak Mahal, had set up the stage for the musical fulfilment at Sarvatobhadra Chowk. With Jaipur Princess Diya Kumari and Maharaja Padmanabh Singh being the brand ambassadors of the event, there was enough glitterati in presence. As Rahul Ram, the founding member of Indian Ocean, and Nikhil Rao stirred up their strings, Tuheen Chakraborty and Amit Kilam slowly adding the beats, you waited impatiently for Himanshu Joshi to add words to the melody and the mood the others had started. Be it Mann kasturi jag dasturi baat hui na puri re or their tribute to the Narmada river Maa rewa tharo paani nirmal khal khal behto jaye re their tunes and lyrics just stay with you. And when they sang Kabirdas, you just wondered if life was actually so simple or we just forgot about the simplicity. Theirs is not that meaningless cacophony that maybe makes you dance for a minute or two but doesn’t go beyond that. Even if it was Tandanu, a Kannada lullaby that Rahul Ram knew since childhood, a word of which you would not understand if you are from Hindi heartland, like me, the sheer energy of the song was enough to lift your spirits up. Their rendition of Nusrat Fateh Ali Khan’s Akhiyan udeek diyan made everyone sway. The Pakistani legend seemed to be the flavour of the evening as earlier Mame Khan also paid tribute to the singer with Saanu ik pal chaen na aawe. The Manganiyar singer from Rajasthan, known globally for his folk and sufi renditions, had actually set the mood for the evening by starting the musical night with his version of Kesariya baalam aoo ni padhaaro mhare des. Mame Khan and his troupe with sindhi shehnai, kartaal, presented all the flavours of Rajasthan at Jaipur by Nite. His Aave re hitchki from Mirzya by Gulzar, the folk version of famous Nimbudaa nimbudaa that was adapted for Hum Dil de Chuke Sanam, and Dama dam mast qalandar just made the Friday night a perfect one for everyone there. So, make sure you keep September 15-16 reserved for this one-of-a-kind night tourism event in Jaipur next year. There’s another post coming soon telling you all about the food and the third day of the event. 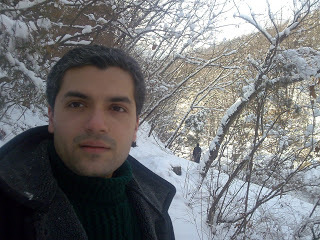 That was the time when I was enjoying every moment of trekking in the snow-capped peaks of Suraksan mountains in South Korea. Excitement of the solo trekking continued even on my return. While I was about to call it a day, I noticed something strange about the passport. It was the time to go into the flashback. To avoid any accidental slipping of passport while trekking, the passport was securely placed in the front pocket of my woollen shirt and there were layers of more warm clothing wrapped around to withstand temperatures up to -160C. 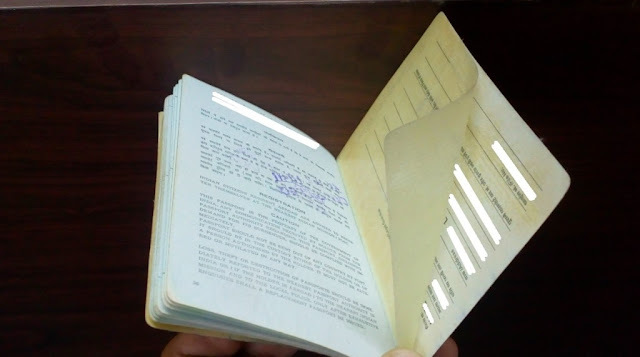 Due to rigors of the trekking the heat generated inside the layers of warm clothing, the lamination of the passport had peeled away from the first and last pages of the passport. Somehow immigration officials got convinced by my innocence and I was able to return to my home safely. Looking back at this incident I was analysing on what I could have done to avoid such a situation. It is pretty obvious and natural that in order to keep identity documents safe we prefer to stuff these inside our pockets. Stuffing in the pockets ensures that we can always feel that passport or other documents are still inside our pockets. 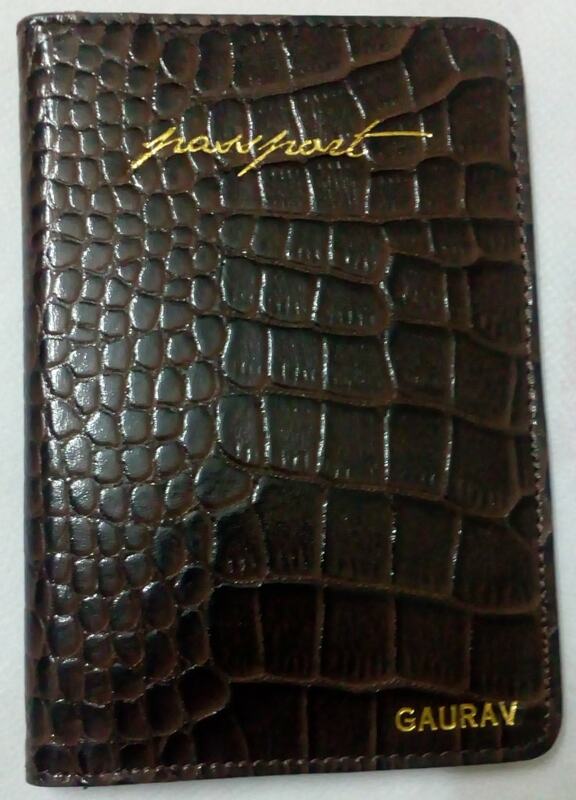 After deliberating on the passport issue, I realised that if I had suitable passport holder…??? 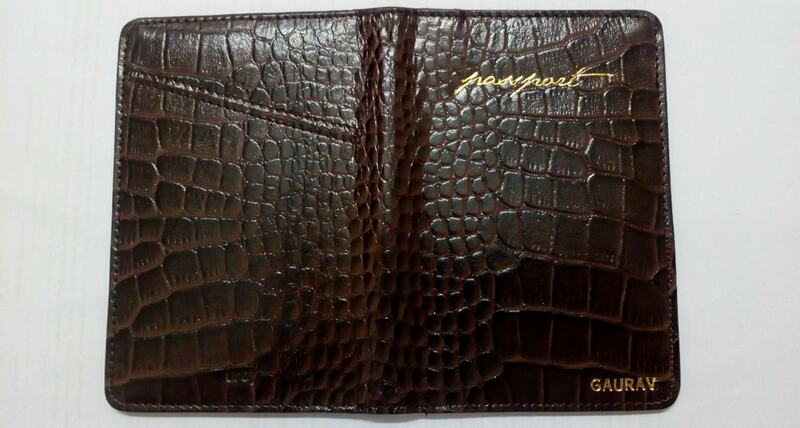 On realisation, I started searching for some suitable passport holder. 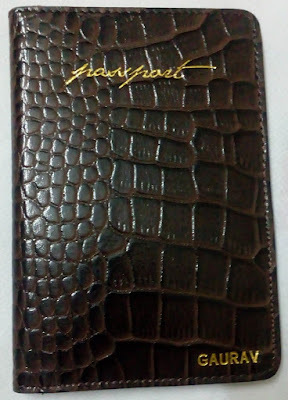 After spending lot of hours on n number of online sites, I finally came across passport holder by Urby. Received the passport holder well placed inside a canvas drawstring pouch and within 2 days of ordering. That is lightning fast delivery, probably the best I ever had for any online ordering. Keeping documents well secured is utmost priority, those who have lost passport in foreign lands know the trauma of it. Beautifully designed and well stitched, Urby passport holder is sleek with elegant and premium feel to the user. Premium croc embossed leather with your name printed on the front and soft leather interiors, it is an ideal accessory to suit your personal style and carry all your necessary documents at one place. 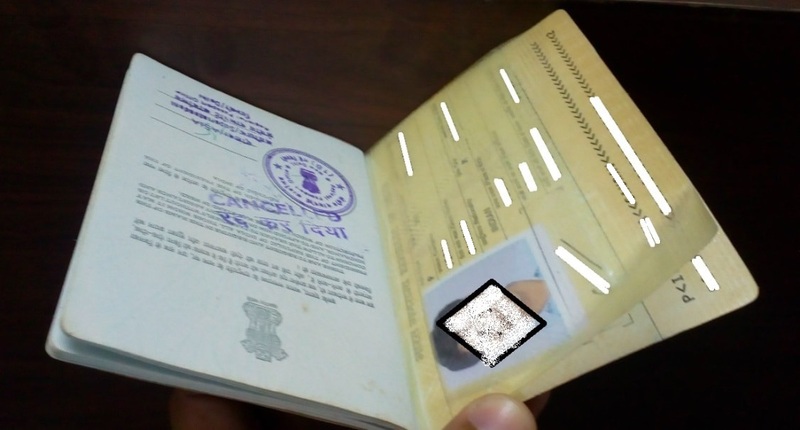 Also at times while in India or abroad you need to carry a number of documents likewise driving license/ foreign exchange card and some currency notes as well. The space offered by this passport holder is sufficient to carry all the requirements for a hassle free travel at one place. A slot at the bottom side can be utilised for visiting cards. Can engage in some unexpected business activity while on the travel. 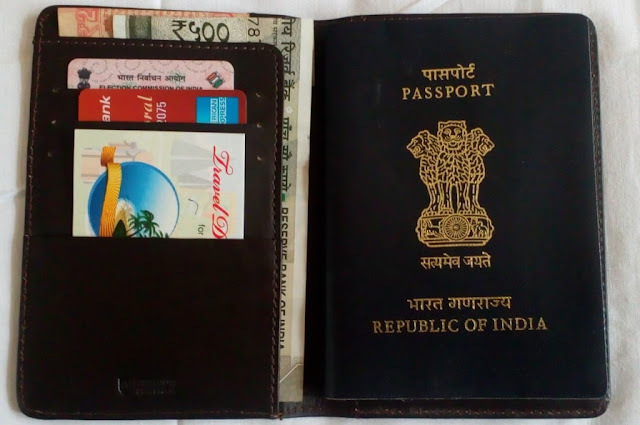 There is an open section and a back slot to carry few currency notes/ travel tickets/ inland travel permits or some coins. (Return journey (To and Fro) highway toll tickets generally tend to get misplaced when kept inside the car and stored in wallets or travel bags). With dimensions of 13.5 cm (L) x 9.5 cm (W) x 0.2 cm (H) it can comfortably be placed inside your pocket. Found it pretty useful and in the last few days have tried to use it as a replacement for my regular wallet as well. Urby Passport Holder is an ideal companion for your styling exploration. When not travelling, the canvas pouch will take care of your passport holder. Please take care of your documents as losing any of them can make a big dent in your trip plans. Forgot to mention that I was advised by immigration people to get a new passport in order to avoid any unexpected experience in future. So I had to get a new passport. Ahobilam, a noted pilgrimage centre for Hindus, is situated at distance of around 130 km. 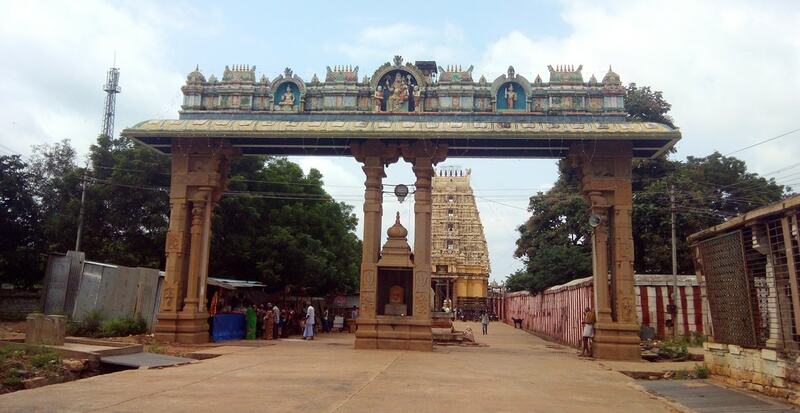 from Kurnool Railway Station, 68 Kms from the Nandyal Railway Station and 24 km. from Allagadda. 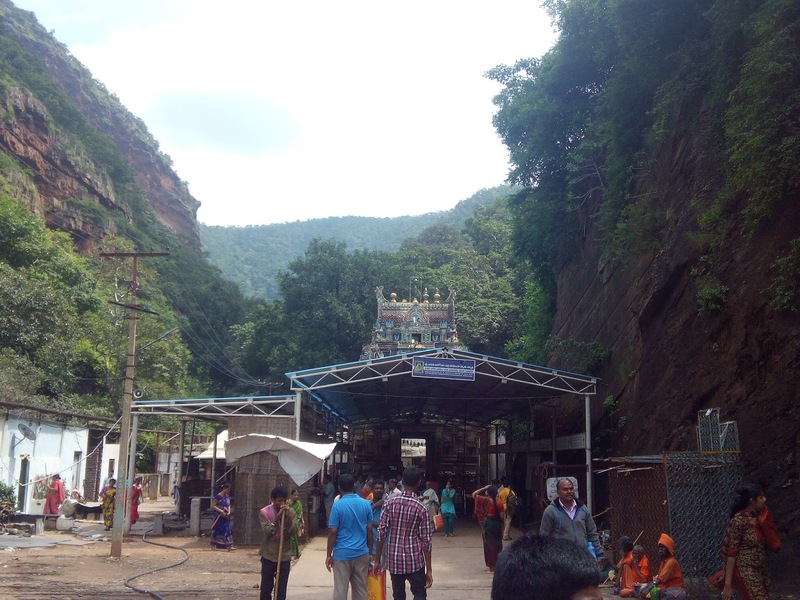 Ahobilam, consists of lower Ahobilam and Upper Ahobilam, is the place where Lord Narasimha had manifested himself in a natural cavern of rock to rip apart the most ferocious demon Hiranyakashipu. Involving some serious trekking all the way from lower Ahobilam to the highest point of the mountain, Ugra Stambha, it requires both devotion and strength to cover all the nine temples, which depicts Nava Narasimha (Nine forms of Narasimha). 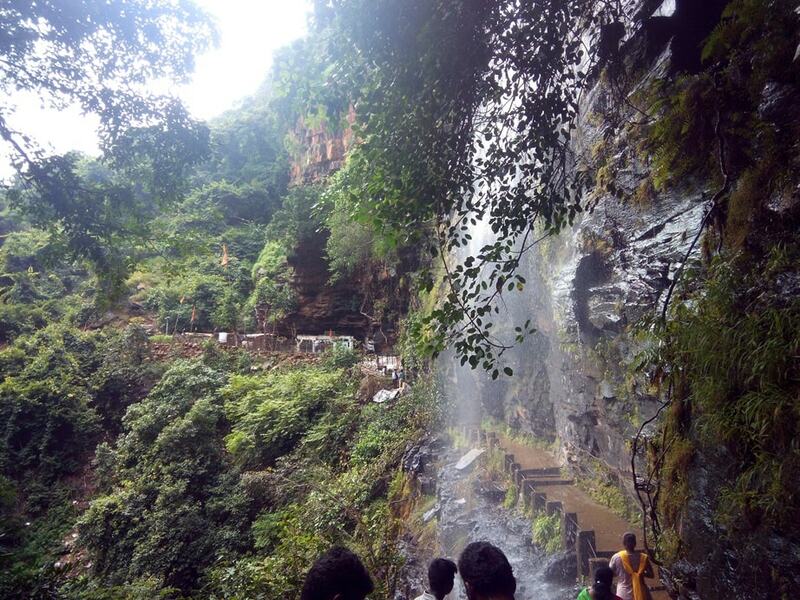 First in the stretch - Lower Ahobilam. 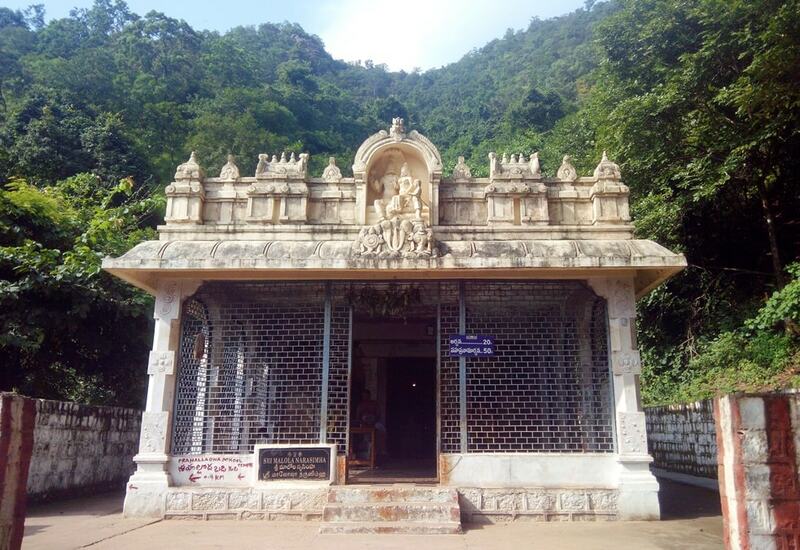 There is a temple of Prahlada varada i.e., the aspect of Lord Narasimha as blessing Prahlada in the village of Lower Ahobilam, which is also known as Chinna-Ahobilam and Diguva-Tirupati. You will be awestruck by the huge and beautiful piece of architectures in the temple. 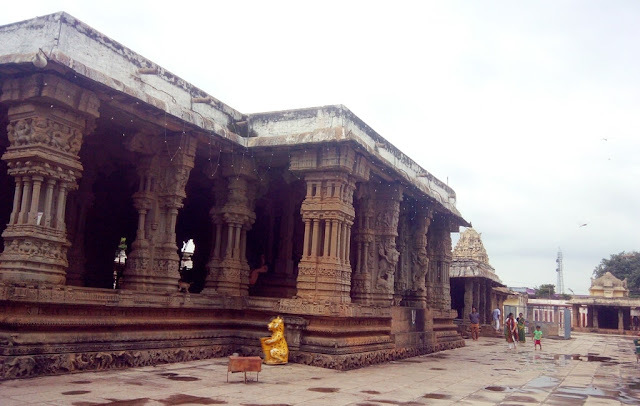 If you get a chance, then do attend the aarti in the temple premises. Various classical instruments are played rhythmically by the old priests, with utter devotion, to please the Narasimha Lord. 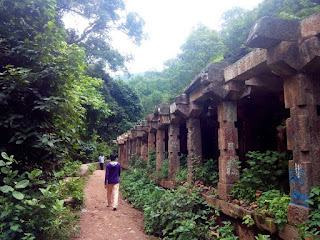 Post taking blessings from Lower Ahobilam temple, head for Upper Ahobilam, there is a road of eight Kilometres from Lower Ahobilam right up to foot of the hill of Upper Ahobilam, situated on a plateau. 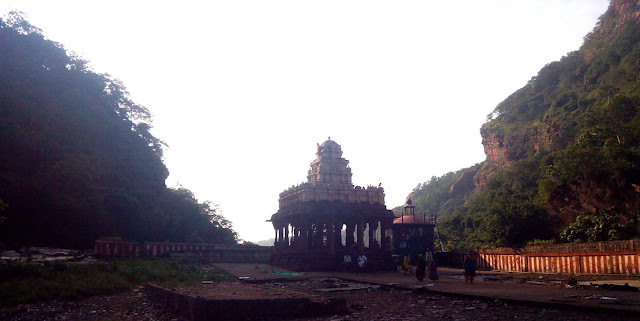 The Lord of Upper Ahobilam temple is known as Ahobelesvara. It is firmly believed that the God had manifested himself in a natural cavern of the rock and is one of the 108 "Divya Tirthas" (sacred places) of India. You are ready to start your trek from Upper Ahobilam on wards, grab the stick from here and you are set to go. If you are trekking in rainy season, then the trek becomes little easy and less tiring as you will keep refreshing by the water flowing down through-out the trek. 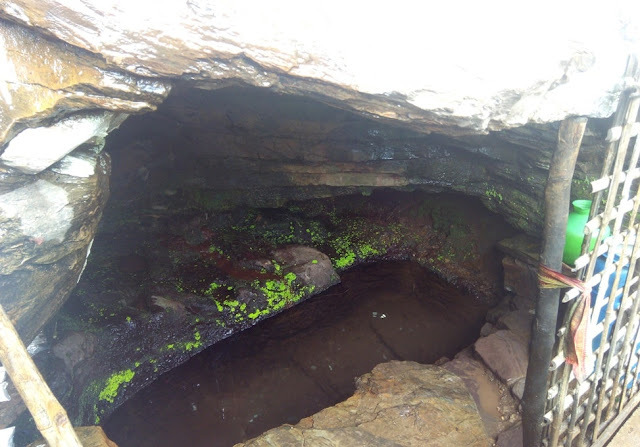 There is a small water reservoir near the Jwala Narasimha temple, the local priests and devotees say that when Lord Narasimha killed the demon Hirnakashyapu, the Lord washed the hands in this reservoir and because of this the water still looks little reddish and red taints are there on the rocks as well. At a distance of about 8 Km from Upper Ahobilam temple, Ugra Stambham is the place where Lord appeared in the form of Narasimha and the cleft is known as 'UGRA STAMBHAM'. 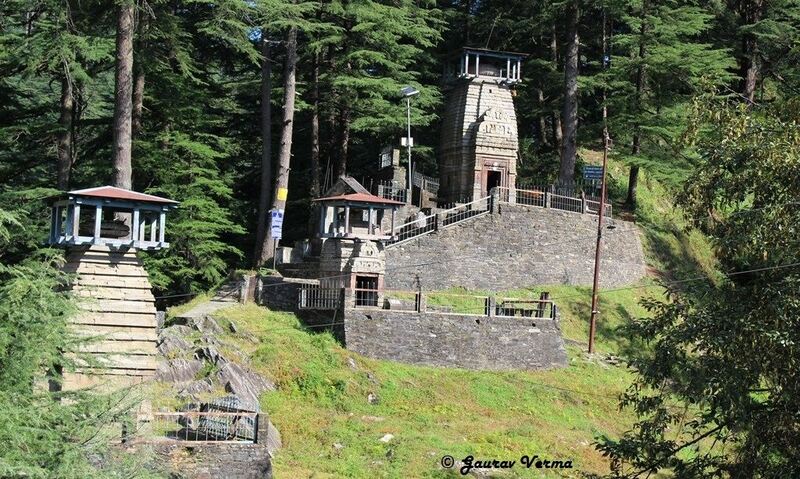 Good to cover the highest point, Ugra Stambham, first and then visit rest of the temples while descending. 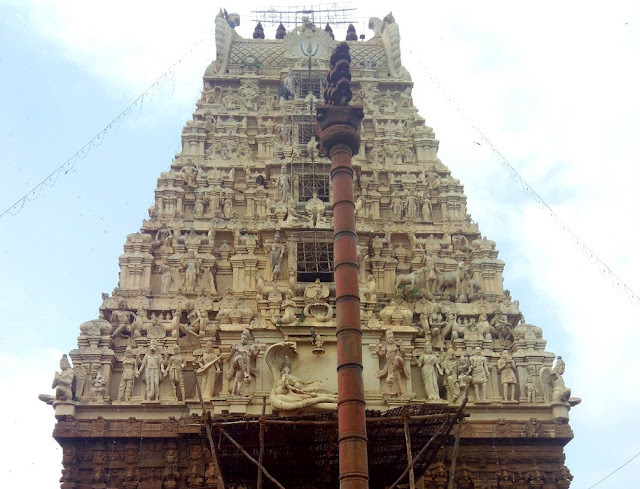 Take at least two days with you to cover all the places in Ahobilam. 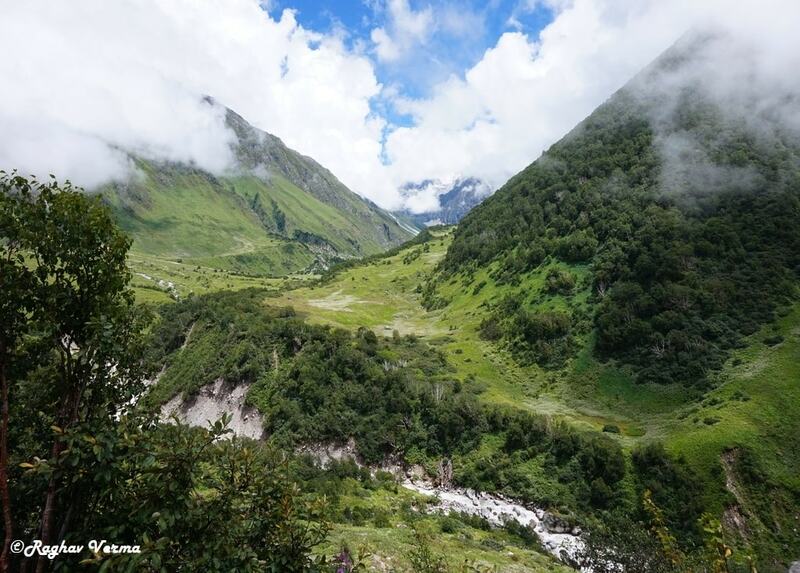 Keep yourself hydrated while trekking. 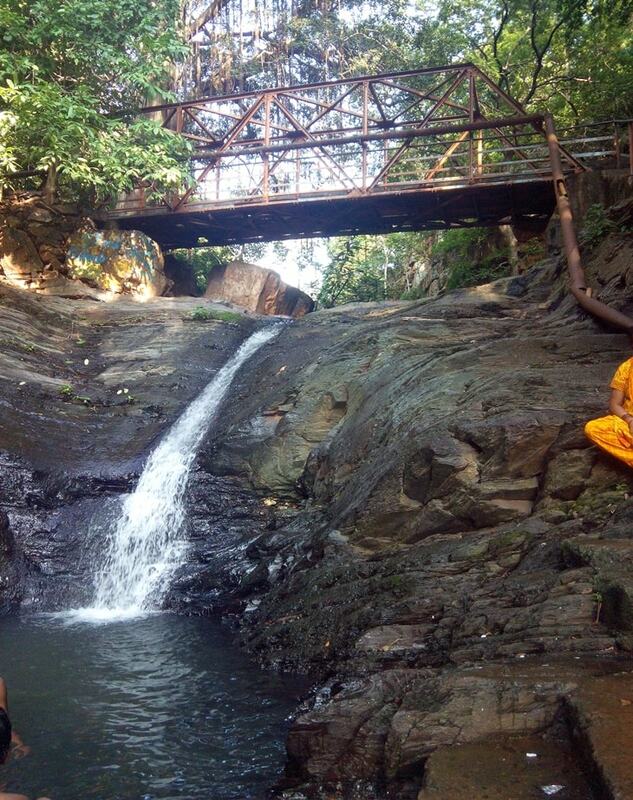 Ahobilam is one of the amazing trekking destinations near Chennai, Pune. All you need is a long weekend. Happy Trekking!! !